The bluffs and hills of Valley Bay Beach. The bluffs and hills here are great for hiking and landscape photography. On a typical breezy day, ospreys can be seen slowly gliding by as they search for food. Access can be difficult to this beach. 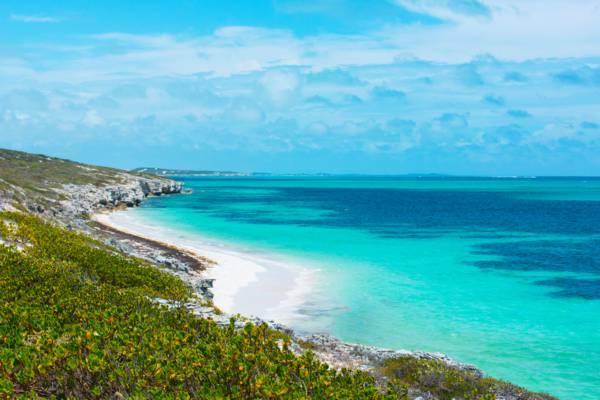 This wild and rugged coast is found on the east coast of South Caicos and fronts the Turks Islands Passage; the deep marine channel that the Caicos Archipelago from the Turks Islands. Much of this coastline is in limestone ironshore cliff that ranges in height from about 10 to 30 feet (3m to 9m). Several secluded beaches can be found hidden at the base of the cliff in places. Valley Bay Beach excels as a hiking destination. On the beach and at the low points on the cliffs, interesting flotsam can be found, much of which travelled the long distance from across the Atlantic. The swimming conditions are not up to the standard of Grace Bay Beach and some of the other top coasts in the Turks and Caicos, but many patches are nevertheless beautiful. Two ridges, Two Sister’s Hill and Tateny Field Hill, follow the coastline a short distance inland. The view from the summits overlooking Bell Sound and the South Caicos salinas are spectacular. The rugged sea cliffs and bluffs of the region. 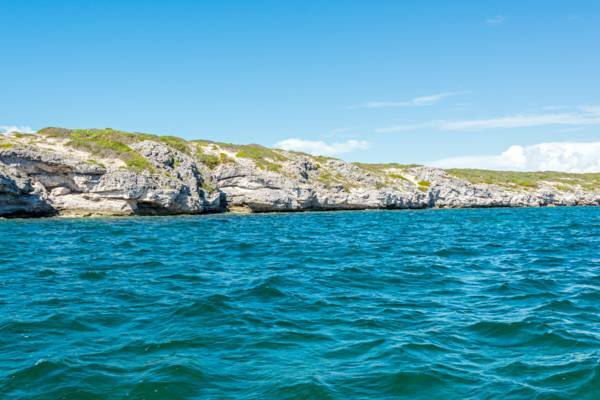 When ocean and wind conditions are calm, great snorkelling can be found at the many coral heads off the beach here. The southern end Valley Bay where the coast meets Highlands Bay tends to have the best sights. Access to Valley Bay Beach is difficult. A few unpaved and rather rough roads can be found nearby, however, it’s not possible to drive directly to the coast. The closest road access are the tracks leading to the Highlands House and Highlands Bay. Another option is an abandoned network of overgrown roads from a development project. It’s best to simply follow the unpaved road east of the expansive main salina and explore until an appealing stopping spot is found. This entire region of the island is uninhabited. Due to the typically intense heat and sun, we recommend taking plenty of drinking water.